After three great days in San Sebastian, we swung over to Barcelona for the final leg of our trip. Our first restaurant visit was to Dos Palillos. Dos Palillos is the creation of Albert Raurich, who from 1999 through 2007 was the chef de cuisine at El Bulli. Those expecting another temple of modern gastronomy or showcase of cutting edge cooking technology, however, might well be disappointed. At Dos Palillos, Raurich, along with head chef Takeshi Somekawa, instead explores - using mostly traditional cooking methods - the curious parallels and intersections between Spanish and Asian cuisines. Dos Palillos is located down the incredibly narrow Carrer Elisabets in the funky El Raval neighborhood, on the ground floor of the Casa Camper hotel (a product of the Camper brand which sells moderately hip sneakers for what seem like incredibly high prices). The name - which means "two toothpicks" - is itself a play on those aforementioned commonalities, analogizing between the toothpicks commonly used for eating tapas and the chopsticks of Asian cuisine. 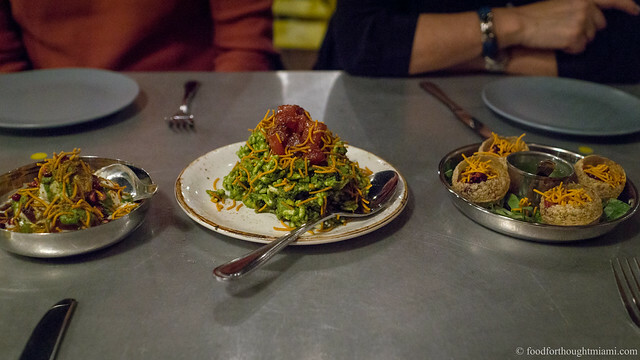 Small portion sizes likewise bridge the two food cultures, the Spanish tapas being easily comparable to either the small dishes of a Japanese izakaya or Chinese dim sum, as does a respect and appreciation for prime raw ingredients. The restaurant's layout also plays on the Asian/Spanish theme, with the front area being a very typical (almost nondescript) looking Spanish bar, while after passing through a beaded curtain, the back room houses an Asian inspired food bar with open kitchen (which actually reminded me very much of a low-budget version of a L'Atelier de Joel Robuchon). I always like an open kitchen, and particularly enjoy the intimacy of this kind of layout, where the person who prepares your food is often the one to actually hand it to you. 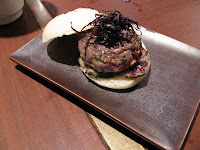 It certainly seems to me that the Spanish-Asian mashup idea is gaining increasing traction in Spain, with Dos Palillos and Kabuki Wellington and Diverxo in Madrid (both of which we missed) as prominent examples. What's less clear to me is whether there's really anything so remarkable about it, as we in the U.S. are pretty accustomed to seeing these type of East-West hodge-podges (i.e., Asia de Cuba, Sushi Samba ... - and yes, you're certainly welcome to question whether it's being done well). But let's set aside that question for the moment, and focus on the most important question - how's the food? The menu on the Asian bar side offers a couple tasting menus at different price points for more extensive course offerings (I think in the more casual front bar you can order a la carte as well). The most expensive option was, I believe, €65 for about 15 courses. Here's the rundown. [Sorry for the atrocious layout of this post - I'm working on fixing it. I've cut back on some of the pictures and added links to them instead. The full set of pictures can be found here on flickr]. wontons - crispy fried shells enclosing a fine mince of pork (I believe, memory is fading), generously sprinkled with pungent pepper. A great, addictive snack. Also served at the start of the meal were some vibrant magenta pickles, presumably colored with beet juice though I'm not sure what the pickles themselves were made from. chicharrones - perhaps not what they were called on the menu, but these were perfectly fried strips of chicken skin, assertively spiced with curry powder. Even better than the wontons. 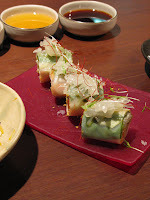 summer roll - again, perhaps not what it was called on the menu, though certainly what it reminded me of, a light rice paper wrap filled with vegetables, served cool, and topped with grapefruit segments, chili threads and tiny baby sprouts. You'll see a couple dipping sauces in the corner of the picture, one a ponzu, the other a fruitier orange-yuzu sauce. These were presented, almost Benihana-esque, at the beginning of the meal with appropriate dipping suggestions for some of the early courses. sardine sunomono - a typical Japanese dish of vinegared fish and vegetables, done here with nice fat slabs of silver-skinned sardine, along with lightly pickled cauliflower, carrots, cucumber and topped with fresh kaiware (daikon sprout). ankimo - one of the standout dishes of the night, perhaps in part because it's one of my favorite ingredients. Ankimo is monkfish liver, poached and chilled, and served here with a couple different kinds of seaweed (the dark green type being one I'm used to seeing in Japanese dishes, the red branched one more unusual for me), with a slightly sweet reduced soy sauce along with cubes of a jelled citrus sauce. Monkfish liver is sometimes called "foie gras of the sea," which might be a bit generous, but it does have something of that same richness and depth of flavor along with a bit of a seafood twang. 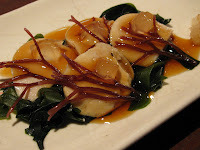 navajas - another standout, some of the smallest, most delicate razor clams I've ever seen are served cold with a Thai red curry sauce and flecks of sea beans and more colorful seaweed. trout roe chawan mushi - a chawan mushi is a Japanese custard, with an incredibly delicate quivering texture, here infused with dashi flavors and topped with trout roe. A beautiful presentation, and the flavor and texture of the chawan mushi were wonderful. The combination with the trout roe could have been fantastic, but unfortunately the roe were dissatisfyingly firm in texture. 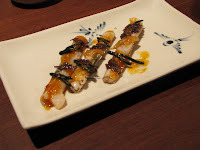 They had very little give and were almost crunchy, a jarring contrast against the creamy chawan mushi. 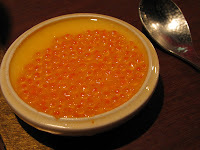 I think I would have preferred the more giving, liquid texture of a salmon roe to pair with the custard. tempura tomato - simple but surprisingly good. 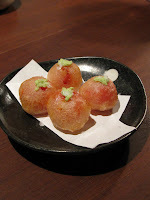 Juicy, sweet cherry tomatoes are fried with a very thin tempura batter, and topped with a dab of wasabi. Just the slightest hint of crunch from the batter, followed by a gush of near-molten hot tomato, followed by the kick of the wasabi. 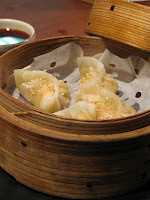 shiu mai - steamed dumplings, stuffed with minced pork and shrimp with a hint of foie gras, if I recall right. These were fine dumplings indeed. tuna don - very lightly seared tuna belly (toro in Japanese, ventresca to the Spaniards) over sushi rice, served with sheets of nori and a dab of wasabi for some DIY maki. Nice rich fatty tuna. 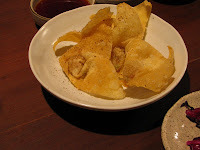 gyoza - pan-fried pork dumplings, a/k/a postickers. Good but nothing particularly special about this iteration. japoburger - a plump little miniburger, seared just rare, laid over some lightly pickled cucumbers for something of a banh mi effect. 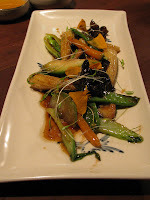 verduras - stir-fried vegetables, a nice melange including baby bok choi, snow peas, baby corn, baby carrots, all in a light soy-based sauce, and flecked with little micro sprouts and flower petals. Decent but not very exciting. chicken yakitori - the traditional Japanese skewered and grilled chicken, lightly brushed with a soy-sake-mirin sauce and sprinkled, I believe, with schichimi togarashi. 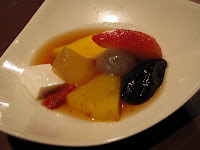 fruit salad - pieces of pineapple, mango, strawberry, melon, prune, goji berry, a cube of tofu-textured creamy coconut, macerated in a reduced anise-infused tea. Hey - is that a spherified something-or-other in the middle there? Nope - just a good old-fashioned lychee. The fruit salad was followed by a creamy yuzu ice cream, which just missed the mark for me. Overall, while I enjoyed all of our meal, and a few items were truly excellent - the ankimo, the navajas, the tempura tomato in particular stand out - several others struck me as no more or less special than something I could get at my neighborhood izakaya (though in fairness, I happen to have an excellent izakaya pretty close to me despite the relative dearth of good Japanese food in Miami). There also wasn't all that much that really struck me as a real fusion or confluence of Asian and Spanish cookery - rather, this was pretty straight-ahead Chinese and Japanese for the most part. It's good eats, and I'd happily recommend it as a fun, satisfying, and fairly priced meal, but there's nothing particularly revolutionary going on here, which is something of a disappointment given the chef's resume. I'm not sure how much to read into it, but it is interesting that both Raurich and Albert Adrià (creative director at El Bulli and brother of Ferran Adrià), who recently opened the relatively traditional tapas bar Inopia in Barcelona and even more recently announced he is leaving El Bulli, both appear to be retreating from the avant garde. One of the most remarkable things about reading A Day at El Bulli (once you get past the overwhelmingly self-congratulatory tone) is the incredible focus on the methodology of creativity. There can be little doubt that the level of creativity and innovation expected must be phenomenally demanding and draining. Sometimes you just want to serve some good simple food. Though "simple" may be understating the level of quality and flavor that many of Dos Palillos' dishes acheive, there's nothing wrong with that either. I'm not a Spanish-speaker, but going by the online translators, "palillos" actually means both "chopsticks" and "toothpicks" (all the more fitting).